This online newsletter archive provides back issues, April 1990 to December 2001, of Marine Notes in downloadable PDF format. 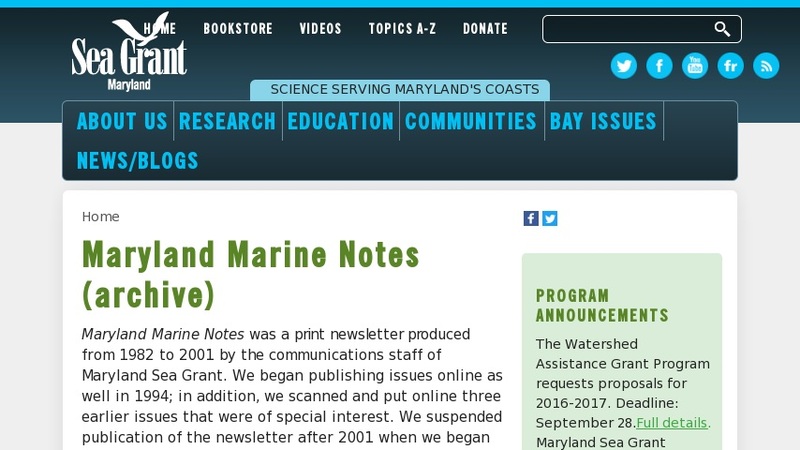 Articles cover news of research, education and outreach services of Maryland Sea Grant. Topics include: fisheries management, issues and advances; biology of keystone species like blue crabs, oysters, seagrasses, striped bass; coastal zone management; Chesapeake Bay habitats and restoration; seafood; aquaculture; impacts of exotic species; coastal history; and more.